These incidents arise from the government’s intentional tendency to create an objectively explosive and provocatory situation for the students and for the workers fighting with them: the UNEF declares its entire solidarity with victims of police repression, on whatever occasion it is used. The attitude of the police makes them entirely responsible for all confrontations, Particularly today and tomorrow, the presence of large forces in the Latin Quarter, their constant comings and goings, the way they disperse all groups, are so many provocations: if incidents occur, the government must know that it causes them. The UNEF makes no call for demonstrations today or tomorrow. As a counter-measure it proposes that all Paris and provincial militants make Monday, May 27 a national day for demonstrations, to be held after 5 P.M.
For a long time now the UNEF has emphasised that the University struggle is meaningless unless it becomes a part of the framework of confrontation and combat against the capitalist regime: true democratisation of education can only exist in liaison with an overthrow of production relationships and the transformation of economic structures by and for the workers. It is very evident that on all these points the government and General de Gaulle are unwilling to consider the nature of our combat and that they see it only from the standpoint of perpetuation of the present system. Therefore, we consider that there can be no dialogue with the regime. 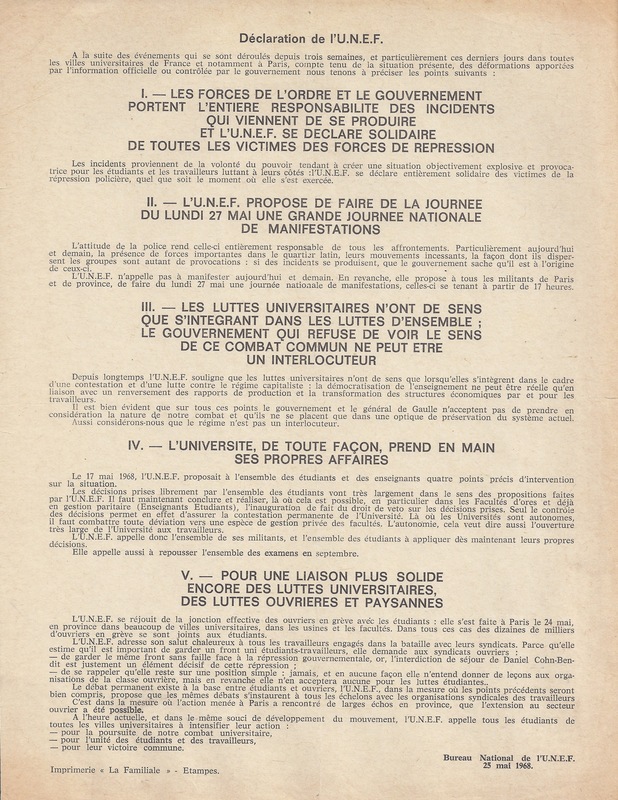 On May 17, 1968, the UNEF proposed to all students and professors four precise points on which pressure may be brought to bear. The decisions freely taken by the student body are in broad agreement with proposals made by the UNEF. Wherever possible, particularly in the faculties henceforth under co-equal administration (teacher-student), we must now conclude and actually inaugurate the right of veto on all decisions taken. In reality, only control over decisions will make it possible to ensure permanent University confrontation. Wherever universities are autonomous, all deviation towards any sort of private administration of the faculties must be fought against. Autonomy also means that the University should be widely opened to workers. The UNEF therefore calls on all its militants and the whole student body to apply their own decisions from now on. It also calls for postponement of all examinations until September. The UNEF welcomes the actual junction of striking workers with students which took place in Paris on May 24, as well as in many provincial University cities, in the factories, and in the facultés. In all these cases tens of thousands of striking workers have joined the students. – To maintain the same solid front in face of government repression. As it happens, the refusal to give Daniel Cohn-Bendit a residence permit is precisely a decisive element of this repression. -To remember that our position is a simple one: never, and in no way, do we intend to give lessons to working class organizations, but on the other hand, none will be accepted with regard to the student struggle. Permanent discussions exist at the grass roots between students and workers. To the extent that the aforementioned points are clearly understood, the UNEF proposes that the same discussions be begun on all levels with the workers’ union organizations. The degree to which action carried out in Paris has been reproduced in the provinces has made extension to the workers sector possible. – for their common victory.